Selected objects for a discerning, creative man who understands craftsmanship and appreciates the simple things. A most suitable for gift for whenever and wherever. A rich history of leather craftsmanship goes into each piece created by Made Solid, where every item is made by hand, from start to finish, in Los Angeles. Peter Maxwell designs his company’s products with simplicity and functionality in mind, as well as bringing a touch of the diverse history of The West to everything they do. A simple idea together with a lengthy process produce these fusions of leather and stone. Each piece is an art object in its own right, its use limited only by your imagination. With patterns of use developing a beautiful patina in the leather over time, this work will become a true reflection of the owner. Will Hodges created his Texas design studio Tactile Turn in 2011. From a small machine shop it has grown to be a turning house for the design and production of exquisitely hand-crafted premium pens, made with an exceptional eye for quality and precision of technique. Will has created an exclusive design for Assembly of Objects. Based on his Mover custom machined click pen in raw aluminium, this design has a bead blasted finish, giving a stunning matte feel. The body is made from 7075 aluminium, which feels light in the hand, with a clip made from 301 spring steel. Complete with the Pilot G2 0.38mm black ink gel refill, and packaged in a custom tool box. Founded in 2000 by Miles Abelson, Postalco began life as a single product intended for his wife, Yuri. Today, their company creates a wide range of products, made in Japan, which keep in mind their design mantra of supreme utility, ineffable warmth and the beauty of understatement. Postalco are renowned for their ongoing design collaborations. This A6 notebook is bound in a light blue linen which will lighten with use, in turn revealing the weave of the fabric. Suitable for both writing and drawing, the chlorine-free pages are printed with Pin-graph, Postalco’s original 1mm blue graph paper. The steel spiral binding is set in such a way it allows the spine to be labelled. Studio Cue LA was envisioned by Keiko Matsuo, a Japanese holistic qi therapist for over thirty years. Together with Tsugu Wada, they have created a peaceful daytime retreat in Topanga Canyon, California, with GOLDA as their own line of handmade, personal products. A conifer tree from Aomori, Japan, Hiba is revered for its unique antimicrobial, germicidal, insect repellant and deodorant qualities. Hiba Wood atmosphere incense has a unique citrusy, cedar-like fragrance that is purifying, uplifting and stimulating. 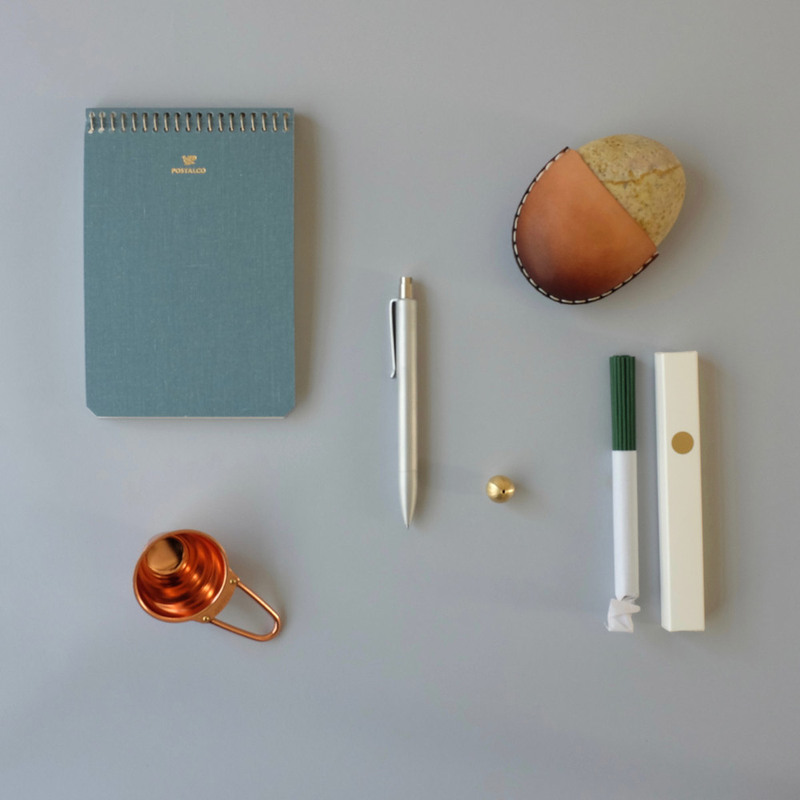 Each box contains thirty slow-burning incense sticks, accompanied by a spherical brass holder with base, which makes for a very elegant desktop addition. Hario, Japan, have been developing innovative speciality coffee equipment since 1921. Their famous V60 coffee dripper drove the current interest in manual coffee brewing equipment, and they are revolutionary in their implementation of new technologies to greatly reduce the environmental impact of their production. This copper coffee measuring scoop is a design classic. Made from the highest quality copper, it has a 12g capacity and is simply beautiful to hold and to use. Hand washing recommended, it is guaranteed to improve your personal coffee-making experience.